So the big day finally arrived. If you had of told me 28 months ago that I'd be getting married in Korea, I would have laughed and advised you to seek professional help. Before I go any further, I would like to say thanks to Saerang Lee who took the day off from work to take most of the photos in this blog post. Here is a video of the ceremony. We weren't getting married until 1:20PM, but we had to go to the wedding hall at 8:30 to get hair and make-up done and get dressed. Jihyeon was first in the hot seat. We then sat around and drank some coffee until it was time to get dressed. 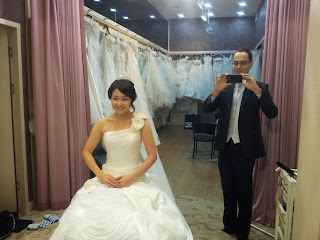 In Korea it is very unusual for a bride to buy a wedding dress. Normally, people will rent them from the wedding hall. In the picture below, you can see all the wedding dresses hanging in the back ground. The system seems to work well because Korean women are mostly a similar shape and size. We waited in this room for about 30 minutes until the wedding before ours cleared out of the hall. Then Jihyeon's parents and my parents arrived at the wedding hall, just in time for kick off. Our mothers are both wearing their traditional Korean Hanboks. I'm not sure why the men wear suits, and not Hanbok's too. We then had to wait by the front door and greet guests as they arrived. I see these a lot in Korea. They are celebratory flowers. You see them at weddings or out the front of new restaurants in their first few weeks. People started arriving and filling the wedding hall. 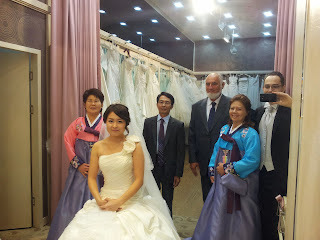 While I was by the front door with my parents, Jihyeon was in a separate room getting her photo taken with the guests. Two of her co-workers from the English school where she works. I like this photo ^^. A photo with Kayleen, an ex-boss from Australia. More Aussie visitors, this time my uncle John and aunty Val. And Kris and Doug, old long time family friends. Korean Aunt (fathers younger sister) and Uncle. And my mate John, who is also an Aussie teaching English at a public school in Daejeon. On the left is her cousin. Another teacher from the school where Jihyeon works. I got sick of greeting people by the door, so I used my VIP status to do whatever I wanted :). I abandoned my parents and spent some time with my bride. Hmm, my hands are too big for the gloves. And in this picture is Danny. Danny was in Australia a couple of years ago on a working holiday Visa and spent some time instructing at my Taekwondo club in Australia. ATTN single ladies, Danny is single, has a stable job and great with kids. Another great photo of my wife~~. Another Aunt and Uncle (father's brother). The wedding ceremony in Korea is a little different to Australia. In Korea there is no time during the ceremony to put the wedding rings on. I thought it was a little strange that they picked up so many things from western culture, but neglected to spend 2 minutes on this during the ceremony. Anyway, while sitting in the photo room before the ceremony, we put our rings on. A quick photo with Danny before getting ready to walk down the aisle. Before the ceremony started we had to wait together at the start of the runway. The first to walk down the aisle would be the two mothers, then myself (the groom) and lastly the bride escorted by her father. My father would already be seated at the front of the hall. Jihyeon's friend offered to be the MC. And this is the guy that would preside over the union and do most of the speaking. The two mothers walking down the aisle, hand in hand. I was pretty pissed with the wedding hall for stuffing up the music. They didn't start playing the music until our mothers had walked all the way to the front of the hall and were getting ready to light the candles. How hard is it to press a play button? They greeted the dude at the front. and then had to light some candles. Since, in traditional Korean culture, the grooms mother is seen as being more important she has to light the blue candle first. Once the blue candle is lit, the bride's mother lights the red candle. Note how the candle colour matches the colour of their respective Hanbok's. They then stepped down and bowed to everyone. The girls in the short red skirts are helpers employed by the wedding hall. Then, it was my turn. I had finally convinced Jihyeon to let me walk down the aisle to the theme song from "Star Trek: Into Darkness", but the dumb wedding hall assistants didn't start playing it until I had almost reached the front. Oh well. It still counts as an achievement unlock ^^. and then waited for my bride^^. I had to step forward and bow to her father. After bowing to him, he decided to give me a hug. I then took her by the hand up to the alter. and her father joined her mother to watch the ceremony. before bowing to my parents. We bow to Jihyeon's parents first because traditionally the woman would leave her parents and become responsible for looking her husband's parents. In the olden days, it was not unusual for the wife to be treated horribly by her inlaws, especially her mother inlaw. Thankfully, that is one tradition that is changing with time. A few tears, of happiness I hope. and bowed to everyone as husband and wife. Now this was a funny twist on western culture. The wedding hall assistants wheeled out a table, lit up like a Christmas tree, with a very small cake perched on the top of it. We had to blow the candles out and then cut the cake with a ginormous knife, which was more like a sword. The cake was then wheeled away, never to be seen again (or until the next wedding, Jihyeon was convinced she could see the line where the cake had been cut by the previous wedding earlier that day). Now, for the really weird part. Jihyeon's friends issue the newlywed couple a dare to do in front of everyone. For me, it was pushups while saying "Jihyeon, I love you" in Korean. All those years of doing pushups at Taekwondo finally paid off. Then it was Jihyeon's turn. All over red rover. We then walked out together. Another oddity of a Korean wedding (at least the one performed by the wedding hall that we used) is that there was no "you may now kiss the bride" moment. Not wanting to miss out, once we reached the back of the hall I went in for the kill. It was then time for some group photos. First up, parents. Next up was parents, aunts, uncles, brothers, sisters and cousins. Then Korean side of the family. We then made our way up to a private room where we had arranged a short traditional wedding ceremony. We spent a bucked of money buying traditional Korean Hanbok's, but then we had to put a red wedding Hanbok over the top of our normal Hanbok's. The table was set with some traditional Korean foods. We went for the cheaper package so we had a pretty basic spread (dried squid, dried persimmon, chestnuts and chicken) but I imagine the $1000 package would have a much larger array of foods. There is soju in the tea pot. Jihyeon and I would pour the soju for the elders (parents and older relatives) who would then drink it and dispense some words of wisdom. As with many things in Korea, this traditional ceremony was a shoes off affair. These are the traditional shoes that women would wear. Jihyeon and I then had to do a big bow to my parents. We then poured them some soju, which they drank. And we sat back to listen to their words of wisdom. I didn't warn them they would be expected to say something (because no one told me) so my parents were a bit lost for words. My parents then threw some dates and chestnuts which we had to catch in the white cloth Jihyeon had folded over her arms. The tradition goes, for each chestnut or date you catch you will have a daughter or son respectively. Then we bowed to Jihyeon's family and poured them some soju. and listened to their words of wisdom. Last up were the Australian visitors. Jihyeon and I then had to do a big bow to each other. Then pour soju for each other. and drink it with our arms locked together. Jihyeon then held onto a dried date with her teeth. and I had to bite the other half of the date off. I then had to give Jihyeon a piggy back ride around the table. And she gave me a kiss on the cheek. and then one on the lips. We then took the wedding Hanbok's off and posed for a photo in our regular Hanbok's. Here are some close up's of the artwork on our Hanbok's. Once the traditional ceremony was over and done with, it was time to eat. We went upstairs to the dining hall to get some grub. I was a little worried about what the food would be like. Even though I have only been in Korea a short time, I have been to quite a few weddings. Sadly, the food can often be a bit hit and miss. Luckily, the food at my wedding was more of a hit than a miss. It wasn't fantastic, but it was well above average as far as wedding hall food goes. Pictures below. We sat in a small room to the side of the dining hall where it was a little quieter and we could talk and relax. The Aussie guests got a head start on Jihyeon and I because we had to spend a good 20 minutes walking around the dining hall saying hello to everyone and thanking them for coming. Then, we were finally able to take a load off and have something to eat. You can eat, after this one more photo..... I promise :p.
After we were finished at the wedding hall, the Aussies went back to their hotel while we walked back to Jihyeon's parents place to socialize with the Korean side of my new family and their friends. Lots of shoes taken off at the door. And the friends of Jihyeon's father. They roped dad into sitting at their table and drinking soju with them. And some of the more entrepreneurial in the group were playing cards for money. How much Korean weddings around? I was just curious as I was planning to get married in the future soon also in Korea. Hi Matthew. Sorry it has taken so long to reply. It depends on a lot of things, like how many guests you have, how big the wedding hall is, do you buy their photos, which buffet option you choose for guests, if you choose to have the private traditional ceremony, etc. Buffet = 20,000 won per person, but I think at a minimum we had to pay for 50 guests (1 million won). For extra money, they would put out some more expensive dishes on the buffet.